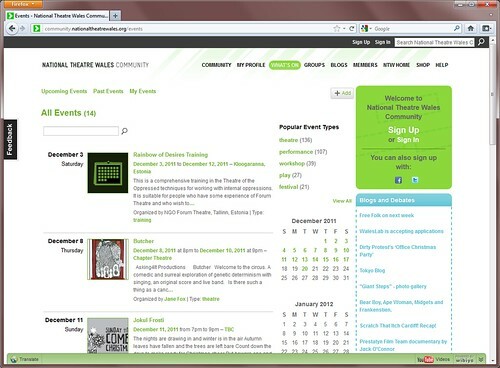 We've worked closely with National Theatre Wales since their first year launched in November 2009, developing their destination website and working with their digital channels. More recently, over the last couple of months we have extend our work into their online community. 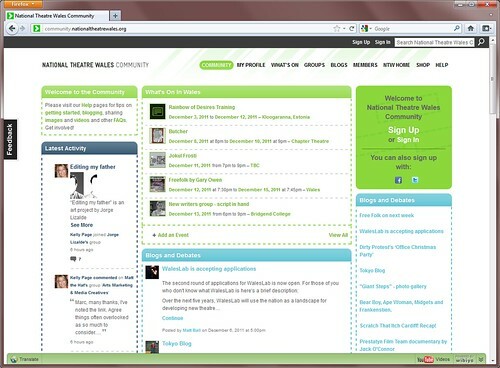 Originally developed and maintained by Native HQ, the National Theatre Wales community has been produced using Ning, a social network platform. We were asked to develop the style and format of the tools provided by Ning in order to enhance the user's experience of online community. Working with established platforms, such as Ning will always bring constraints, conflict and issues surrounding compatibility following technical workarounds that are needed to develop the online tools to fit in with the community and National Theatre Wales' brand experience. It was important that these technical challenges did not take precedence over the brief, the user's experience was the main issue in hand. With National Theatre Wales and Native HQ, we identified core areas and functions within the community, which were already in existence through the tools provided by Ning, but not easily identified by the users. Working with National Theatre Wales brand guidelines, we developed a series of graphical elements and colour distinctions where these Ning tools were broken down and became instinctive navigational elements for users. The redeveloped community was pushed live early Monday morning, followed by some minor teething problems and will be officially announced to National Theatre Wales community in the coming days.